There is a lovely new batch of stamps and dies available from Penny Black; you can check out the catalogue here. 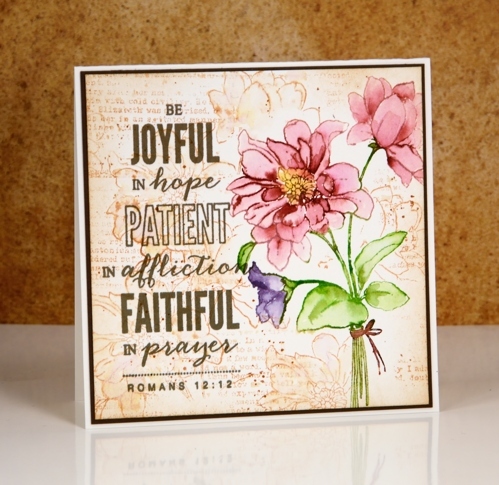 My card today features a couple of the new stamps, full of glee and a scripture verse from the hope shines set. 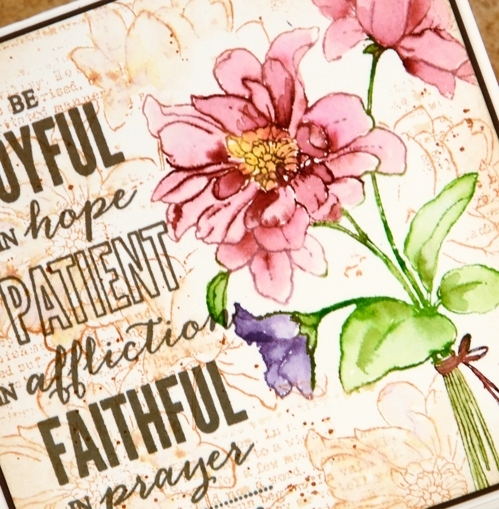 I used my stamp positioner to stamp the ‘full of glee’ image on hot pressed watercolour paper. I started by inking only the pink petals with a Victorian velvet distress stain. I stamped that much, cleaned off the stain and inked the smaller flower in dusty concord, stamped, cleaned and moved onto the leaves and stems in peeled paint stain. Once the whole image was stamped I used a small watercolour brush and water to blend colour from the stamped image into the petals and leaves to fill them. If there was not enough colour I added some stain with the paint brush. I let all the painting dry before adding scattered straw stain to the centre of the flower. To create the background I inked the full of glee stamp with tea dye distress ink and pressed it down randomly around the image then did the same with the text stamp from the footnotes set. I blended some of the ink with a damp paintbrush and added some splatter as well. I finished the panel off with the sentiment stamped in versafine vintage sepia ink. I often switch to versafine ink when doing my sentiments as it is a pigment ink which gives a nice sharp print and sits on the paper rather than sinking into it as dye inks tend to do. I matted the panel and attached it to a natural coloured card base. Such pretty flowers, Heather! And the subtly stamped background adds so much depth! This gorgeous card just might be the one that convinces me to try the no-line water coloring method. It is truly breathtaking in all aspects! Oh so pretty! The colors are luscious! Oh wow I love this card Heather, the colors are beautiful!